For months of dazzling colour - every year! 6 whole months of fabulous colour each year! Under half the normal price for 300 bulbs of this quality! Dazzling colours and shapes from January through to June guaranteed! Plant now for stunning results. Displays get bigger and better each year. 8 top-quality varieties, perfect for borders, containers and grassy areas. Transform your garden with 6 whole months of fabulous colour each year - this fantastic offer is less than half the normal price you'd pay for 300 bulbs of this quality! From January right through to June you'll be amazed by the dazzling array of colours and variety of shapes from these quite brilliant plants. They are perfect for patio containers and flower borders and best of all, each of these items will naturalise, so you'll get bigger and better displays each year for many years to come! 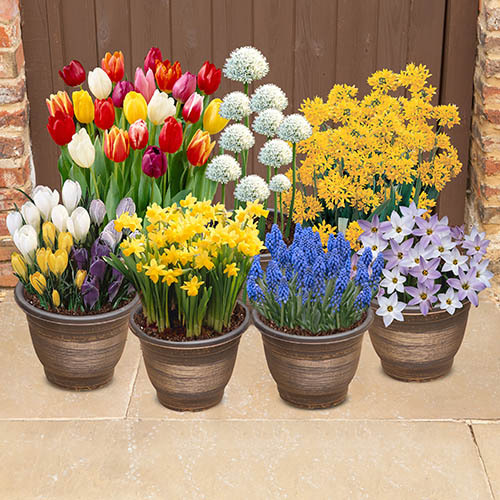 All of these bulbs are guaranteed to flower, so you'll get a minimum of 300 stems of vivid colour throught spring and into early summer.. Tall Tulips 'Triumph' Mixed x 30 bulbs. A kaleidoscope of colour. Incredibly versatile, very strong and sturdy, with the classic tulip shape. Flowers: April. Height: 50cm . Miniature Narcissi Mixed x 15 bulbs. Brilliant in pots, this mixture produces plenty of pretty blooms from late February. Vigorous and strong. Flowers: Late Feb-Apr. Height: 15-20cm. Crocus 'Ruby Giant' x 25 bulbs. Striking violet flowers, great for pots and containers. Flowers: Feb-Mar. Height: 10cm. Brodiaea x 60 bulbs. Light violet, star-shaped trumpet blooms are held at the top of slender stems. Also known as Triteleia, these garden stars make long-lasting cut flowers. Flowers: Jun-Jul. Height: 30cm. Allium Moly x 50 bulbs. Bright yellow heads of tiny flowers. Great for beginners. Flowers: May-Jun. Height: 25cm. Ipheion uniflorum x 30 bulbs. The spring starflower has pale silver-blue star-shaped flowers. Flowers: March. Height 15cm. Muscari x 50 bulbs. The well-loved grape hyacinth with spikes of deep blue, densely packed flower heads, great in beds and pots. Flowers: Mar-Apr Height: 15cm. Note - we reserve the right to substitute one or two components to an equal number and value, should insufficient stocks be available all season. Bulbs such as Daffodils, Tulips and Crocus herald the arrival of spring – there’s nothing more exciting than the sight of their bold and bright colours peeking up from the ground marking the end of a long winter and the start of the warmer weather. root system before the weather becomes too cold. Hardy summer-flowering bulbs like Lilies and Alliums can also be planted in the autumn. Plant in herbaceous borders, in pots, or leave in the ground to naturalise. If planted in pots be sure to water frequently and keep moist. Plant bulbs at twice the depth of the height of the bulb and four times their width apart. e.g 5cm tall bulbs need to be planted 10cm below the surface of the ground and 20cm apart.